Save 40% on All Lighting by Illuminating Experiences!! BLACK FRIDAY SALE: Save 40% on All Lighting by Illuminating Experiences. Exclusively at Lumens. Limited Time Only. Shop Now. No Code Required. Get Free Cell Tealight Holder by Tom Dixon with $400 Tom Dixon Purchase! Tom Dixon: Black Friday Sale: Receive a FREE Cell Tealight Holder by Tom Dixon with $400 Tom Dixon purchase! Use coupon code TOMDIXON at checkout. Ends 12/3. Shop Now. Get Free Cricket Accent Lamp by Robert Abbey with $400 Robert Abbey Purchase! BLACK FRIDAY SALE: Receive a FREE Cricket Accent Lamp by Robert Abbey with $400 Robert Abbey purchase! Use coupon code CRICKET at checkout. Ends 12/3. Shop Now. Get Free Prince AHA Stool by Kartell with $300 Kartell Purchase! BLACK FRIDAY SALE: Receive a FREE Prince AHA Stool by Kartell with $300 Kartell purchase! Use coupon code KARTELL at checkout. Offer Ends 12/3. Shop Now. Get Free Dalu Desk Lamp by Artemide with $349 Artemide Purchase! BLACK FRIDAY SALE: Receive a FREE Dalu Desk Lamp by Artemide with $349 Artemide purchase! Use coupon code: DALU at checkout. Offer Ends 12/3. Shop Now. Receive a Free Set of Chilewich Table Mats with $125+ Chilewich Purchase. BLACK FRIDAY SALE: Receive a FREE set of Chilewich table mats with $125+ Chilewich purchase. And use coupon code CHILEWICH at checkout. Limited Time Only. Shop Now. Get Free Alessi Gift $75 - Alessi Purchase!! BLACK FRIDAY SALE: Get Free Alessi Gift w/ $75 Alessi purchase exclusively at Lumens.com. And Use Coupon Code: ALESSI75 at checkout. Limited Time Only. Shop Now. Save Up To 75% on Select George Kovacs Lighting. BLACK FRIDAY SALE: Save up to 75% on Select George Kovacs Lighting exclusively at Lumens. Limited Time Only. Shop Now. Save 15% on All Lighting by Vibia. BLACK FRIDAY SALE: Save 15% on All Lighting by Vibia. Exclusively at Lumens. Offer Ends 12/3. Shop Now. No Code Needed. Save 19% on All Lamps by Koncept. BLACK FRIDAY SALE: Save 19% on All Lamps by Koncept Plus Get Free Shipping! Use coupon code: KONCEPT at checkout. Exclusively at Lumens. Offer Ends 12/3. Shop Now. Save 15% on The Herman Miller Collection Plus Free Shipping! BLACK FRIDAY SALE: Save 15% on The Herman Miller Collection Plus Get Free Shipping at Lumens.com! Limited Time Only. Shop Now. No Code Required. Save 40% on All Lighting by Le Klint. BLACK FRIDAY SALE: Save 40% on All Lighting by Le Klint exclusively at Lumens. Offer Ends 12/3. Shop Now. Save 20% on All Lighting, Furniture Gifts & Accessories by Jonathan Adler. BLACK FRIDAY SALE: Save 20% on All Lighting, Furniture Gifts and Accessories by Jonathan Adler exclusively at Lumens. Offer Ends 12/3. Save Up To 75% on Lighting, Home Furnishings, Gifts & More. Save up to 75% on lighting, home furnishings, gifts and more. Lowest prices. 50+ brands. Exclusive offers. 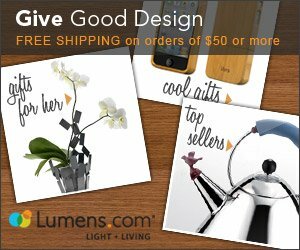 Free gifts at Lumens.com. Shop Now. No Code Needed. Lumens came to the web in 2006 with a goal in mind: to be the best place to shop for lighting, fans, furniture and accessories for people who love modern design. At Lumens, modern design doesn't mean limited design. We call our style “open-minded modern.” We know that a modern design aesthetic can apply to everything from stark-white minimalism to an eclectic space that blends old and new styles—not to mention everything in between. Modern design should have perspective. It should be comfortable, and easy on the eyes. But most importantly, it should be about you. That’s why we’re proud to offer a vast selection of design-oriented ceiling lights, wall lights, floor and table lamps, fans, furniture and home accessories from more than 300 brands.